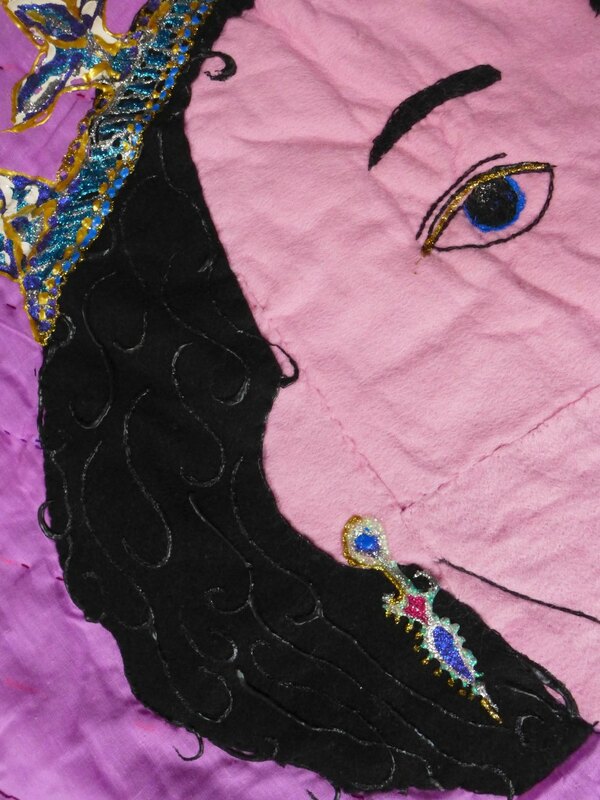 One of seven hangings handmade for the Bangladeshi Mela 2002 (Royal 50th Jubilee) by women at Fitzrovia Neighbourhood Association. Bust of Queen Elizabeth in a white dress with red sash, necklace and crown on a pink background, dark blue gauze border with glued sequins. Photo: Sogand Bahram. 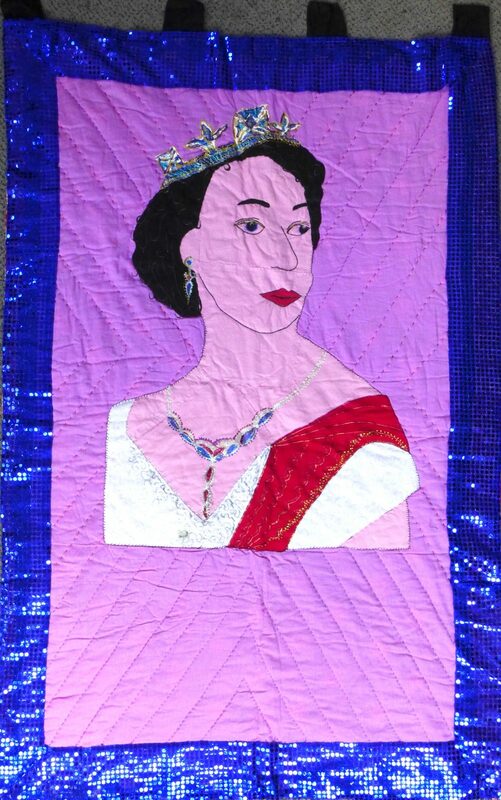 Bust of Queen Elizabeth in a white dress with red sash, necklace and crown on a pink background, dark blue gauze border with glued sequins. 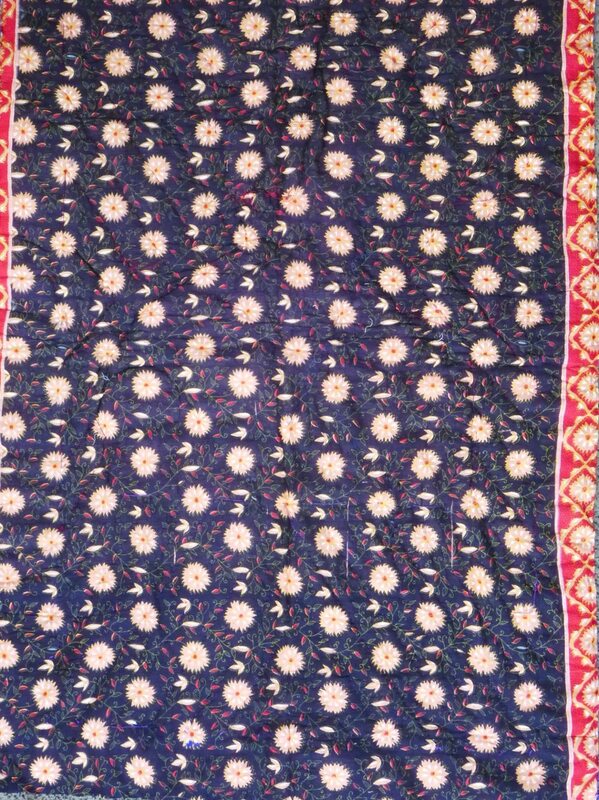 Backed with cotton sari material, dark blue, crimson red border with floral pattern print. Four black cotton hanging tabs at the top. Size: Approx. 90cm x 135cm + four 5cm x 7cm tabs. Material: cotton, wool felt, guaze, sequins, glue, glitter, paint. Condition: excellent, used. Some sequins missing from the gauze border. Available to view from 6.00pm to 8.00pm weekdays from Wednesday 3 June to Friday 12 June 2015, at Fitzrovia Neighbourhood Centre, 39 Tottenham Street, Fitzrovia, London W1T 4RX.